It didn’t take long after Cambodians first started coming to Long Beach as refugees 40 years ago that the first Khmer restaurants appeared. After the brutal Khmer Rouge regime killed millions of their own people and decimated a vibrant culture in the name of communism, those who fled did their best to rebuild the only way they knew how — through food. “One thing about us: we find our survival through food, so to be able to go out and get our own ingredients was big,” says Visoth Tarak Ouk, aka Chef T, the executive chef at Federal Bar in Long Beach, who moved to the city as a baby and remembers Cambodia Town’s early days. Today, Long Beach is home to the largest population of Cambodians anywhere in the United States. In the early 1980s, neighborhood markets where uncommon spices and tropical fruits could be purchased for home cooking began to spring up. Then came restaurants like Phnom Penh Noodle (1985) and gilded nightclubs like New Paradise (now Legend Seafood) that doubled as community centers. They’re where immigrants who came from the Killing Fields could show off their new clothes and cars while eating opulent seafood dinners and dancing under sequin-studded karaoke singers. 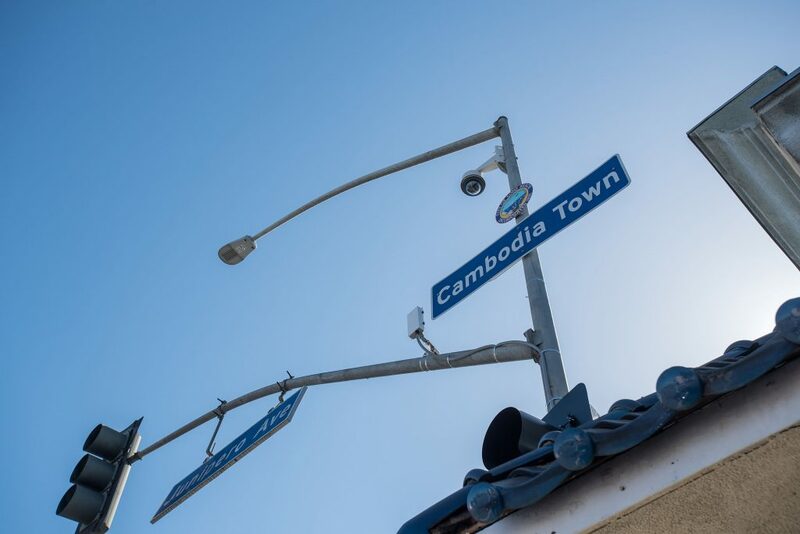 In the span of a few decades, the once-Latino-dominant Anaheim Street became the heart of not just Long Beach’s Cambodian community, but America’s. Today, Long Beach as a whole has become a destination for homesick Cambodians seeking flavors of home, and for Westerners eager to dine on Khmer food for the first (or millionth) time. If you ever need a reminder of the complex, otherworldly flavors that define Cambodian cooking, drive down to Long Beach and order a plate of amok trey from Cambodia Town Food and Music, the restaurant formerly known as Sophy’s, on Pacific Coast Highway. The dish — a spice-rubbed whitefish steamed in coconut milk curry until it achieves a souffle consistency — is a Cambodian specialty that offers a quick tour through the tangy, fishy, spicy, herbal wonderland that define the cuisine in this Southeast Asian country. It’s a flavor profile particular to the country’s signature spice blend kreung, a combination of lemongrass, turmeric, galangal, makrut lime leaves, and more. Down the street, you can dig even deeper into the labor-intensive meals of Khmer cuisine at Phnom Penh Noodle Shack, a tiny breakfast and lunch spot specializing in what is essentially Cambodia’s pho: a pork and beef noodle soup called kuy teav. The bone-filled broth takes hours to make and when it’s done, it’s loaded with offal and dropped otherwise plain, so you can load it up with a buffet of tableside condiments like fish sauce, fermented red beans, and vinegar-soaked chiles.